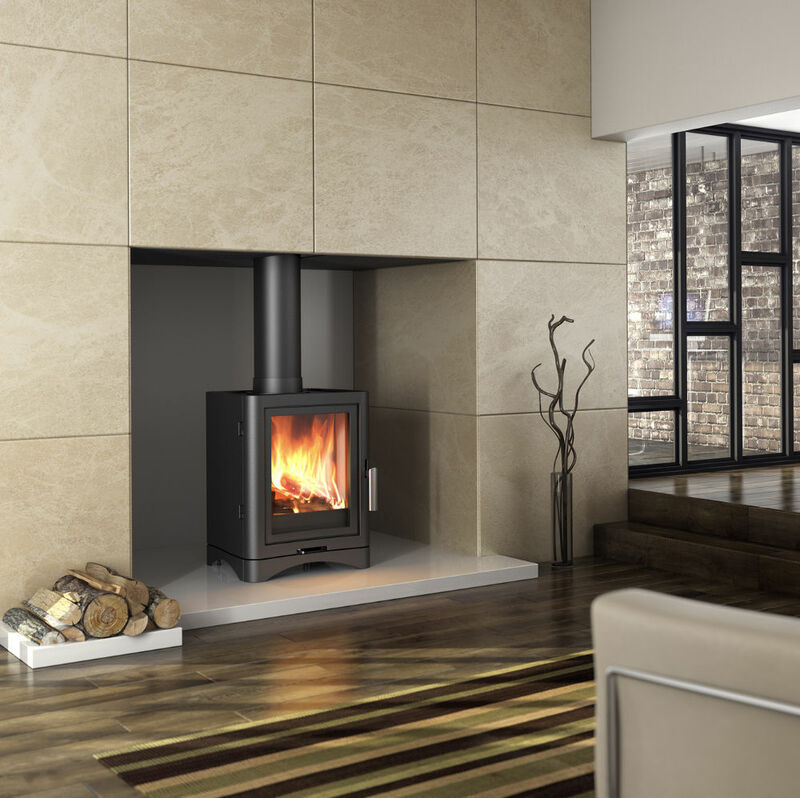 A Broseley contemporary stove with a high efficiency. |This model is also available with a log store. Plain big glass - wood burning only but has ash pan and grate. Ok to use in smokeless area. Stove expert replied: Refuelling should be undertaken when the majority of the wood has been burnt, opening when you have partially burnt wood does affect the efficiency. Stove expert replied: The manufacturer is correct in that creosote shouldn't be being formed inside a chimney. If creosote does occur then it is an indication that the moisture content of the wood being burned is too high or that the chimney liner isn't insulated sufficiently or possibly a combination of both. 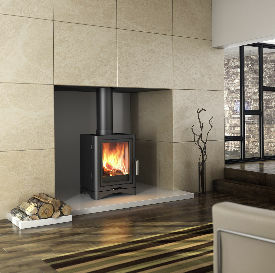 However in the real world wood that isn't fully seasoned can get burnt on occasions, stoves can get turned right down for longer than they should (again leading to condensates), and so for that reason flues and stoves are normally designed so that any condensate formed ends up back in the stove. A simple solution here would be to lift the flue spigot, remove the fire rope and seal it with high temperature silicone (good to 1200 degrees) which will prevent creosote leaking. I checked with the manufacturer and they were happy with this slight modification. The smell of creosote is very unpleasant but that smell is always a timely warning to check the firewood that is being used and to make sure that the liner is sufficiently insulated. Creosote forming in a chimney can lead to a chimney fire and they are dangerous. This is a great stove !!! View of fire inside is great, very large window The heat is outstanding, brilliant quality !!!! !